Note: This is designed to print on the Cube 3 using Cube Print software! I know Slic3r will not slice anything smaller than .5 mm wide and will end up missing supports and some other areas of the print. I don't know about other slicers (like KISSlicer, etc.) but use them at your own peril. You may notice the supports look a bit unusual. This is because I incorporated what I call "blob shields". This greatly reduces the problem with blobbing. 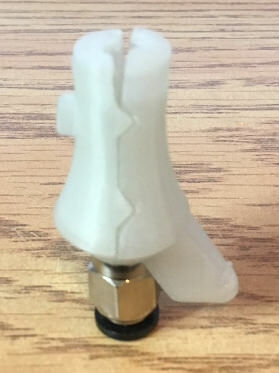 They are currently oriented to be printed with the left extruder, but if you want to print with the right extruder, just rotate them 180 degrees. The shield needs to be facing the direction of the extruder. I'm not sure if anyone else has found this same solution, but I think it may be unique to the Cube 3. I printed the first one with PLA. I printed it again with Inland ABS using the one I had printed in PLA to print it. The PLA print head held up fine but did have some warping due to the higher heat. Not bad for printing ABS with a PLA print head. Inland ABS is a little harder to print the finer details of the print head. I used Mythandar's temp modifier to change the temp to 250 (Cube Print software prints at 260 for ABS). It prints much better this way. It may work fine with 3DS ABS but Inland ABS needed a lower heat. You can print this in PLA if you are only printing with PLA. It should hold up ok. I haven't done extensive testing but the only issue I have had so far was printing ABS with the PLA print head as mentioned above. There are 2 versions of the back piece. One is for M5 thread and the other is for M6.